John Dolan, Deputy General Manager, Manor House Country Hotel, Kiladeas, Co. Fermanagh, Northern Ireland, UK. 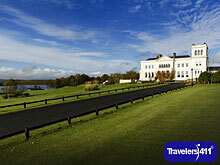 Visit the Travelers411 Directory listing for Manor House Country Hotel. John Dolan, Deputy General Manager, Manor House Country Hotel was on the January 21, 2018 "Travel with Stephanie Abrams!" Radio Show in hour 2. Visit the Directory for Manor House Country Hotel. Sheep Competition, Draft Horse Hitches Show, Fireworks, Carnival Rides and More Fun Awaits. Ireland's airline featuring famous Irish hospitality and connecting the US with 25 European destinations from Hartford (BDL). Start your European vacation or business travel with Aer Lingus.